Право на образование в фокусе международного сотрудничества: Учреждение Университета БРИКС: выступление Специального докладчика по вопросам права на образование Кишора Сингха 17 ноября 2015 года. Учреждение Университета БРИКС: выступление Специального докладчика по вопросам права на образование Кишора Сингха 17 ноября 2015 года. 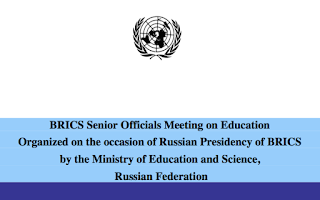 I consider it a privilege to participate in the BRICS Senior Officials Meeting on Education, and I would like to express my gratitude to the Ministry of Education and Science, Russian Federation, for giving me this opportunity. 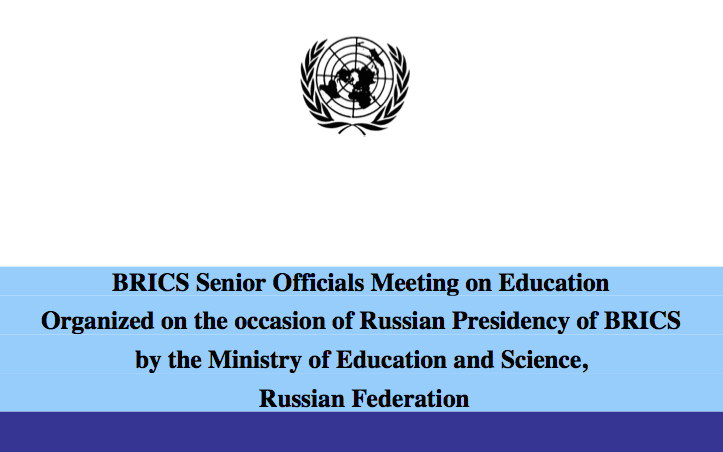 Today’s meeting will remain a special event in the annals of BRICS for collective reflections, with a view to creating BRICS Network University, bringing together research-and-education centers of excellence in BRICS countries. With that perspective, discussions on policies to coordinate areas of mutual interest and develop framework for future cooperation in education are of historic importance for forging collaborative approaches in the field of education. The proposed Memorandum of Understanding among BRICS countries which will set out the principles for creating and functioning of the BRICS Network University along with assigned objectives is a milestone in this collaborative endeavor. BRICS is poised to emerge as interactive academic community, endowed with common research and education agenda. It is gratifying to see primacy being given to some of the key issues in this process, notably quality education and qualification assessment and evaluation systems as well as fostering professional excellence and skills development through technical and vocational education and training. As the United Nations Special Rapporteur on the Right to Education, I have examined these thematic areas in my reports submitted to the United Nations General Assembly and to the Human Rights Council. I am encouraged that with shared concerns, we have so much in common. Policy and programmatic approaches with respect to the BRICS Network University being established give concrete shape to the concepts and ideas embodied in BRICS Declarations. The Ufa Declaration adopted at the Seventh BRICS Summit (9 July 2015) expresses support to “the independent initiatives to establish the BRICS Network University and the BRICS University League.” Earlier, the Brasilia Declaration at the Sixth BRICS Summit (July 15, 2014) encouraged the initiative to establish the BRICS Network University. The meeting of the BRICS Education Ministers held on the margins of the 37th session of the UNESCO General Conference (November 2013) recognized the need for “strengthening collaboration between BRICS universities, and partnerships.” The BRICS Network University has also its genesis in the Joint Declaration (Sanya, Hainan, China, 14 April 2011), stipulating to “continue to hold the BRICS Think-tank Symposiums, and consider establishing a network of research centers of all BRICS countries.” Similarly, “Flow of knowledge amongst our research institutions through joint projects, workshops and exchanges of young scientists” is encouraged by the Delhi Action Plan (Delhi Declaration, March 2012). A BRICS Global University Summit, convened by the Moscow State Institute of International Relations (MGIMO-University) here in Moscow towards end of last October was an eloquent testimony to the enthusiasm among BRICS academic community for moving in the direction of BRICS University Network. Allow me to highlight some issues which I consider to be of key importance for BRICS, bearing in mind the right to education, recent Declarations of BRICS Summits and the proposed BRICS Network University. We are all familiar with the massification of higher education to meet rising demands on education. This results in deterioration of quality and saps professional excellence. The question of weeding out “diploma mills” entailing devaluation of standards, raised in Russian Federation a few years back, is relevant for other countries as well. Repercussions of mushrooming of private higher education establishments must be critically looked into. Sponsored by a range of entities such as individual proprietors or profit-seeking business interests, private higher education has become fastest growing segment of higher education worldwide, involving new international branch campuses and ownership of local institutions operating as cross border higher education. Legal and policy responses are inadequate or non-existent in this respect. In face of such developments, we must always recall State obligations for the right to education which is an internationally established right. States have obligations to adopt laws and policies with a view to progressive realization of the right to higher education, which should be merit-based and freely accessible. In this respect, I would like to refer to the Education 2030 Incheon Declaration and Framework for Action, adopted by the Ministers of Education including those from BRICS only about ten days ago at the High level Meeting, concurrent to the 38th Session of UNESCO General Conference. This Framework for Action stipulates that the provision of tertiary education should be made progressively free, in line with existing international agreements. The political commitments thus undertaken by governments are most significant to safeguard education as a public good, and to control an unregulated free market in higher education with investments by low-quality providers. Corporate interests and corporate funding of higher education imposing exorbitant fees also raise questions not only regarding the affordability of higher education but also ethical questions when Universities compromise on their social function in the name of academic independence. There have been instances when fraudulent practices have come to light in which admission rules are relaxed, the evaluation process is distorted and examinations are faked in different ways. A major challenge to higher education systems is to cope with internationalization of higher education in its various manifestations. In face of such cross border higher education operations involving increasing mobility of staff and learners, and the flow of students moving abroad to enhance academic credentials, the eventuality of private Universities seeking to be associated with the BRICS Network University, and risks and dangers that this may entail must be borne in mind. This must be considered in conjunction with the autonomy of Universities, which is not unfettered, but carries with it social responsibility. BRICS must also give consideration to the emerging Massive Open Online Courses (MOOC), portrayed as an alternative path to access higher education. This can involve creating partnerships between educational institutions in developed and developing countries, governments, development agencies, or the private sector. Many enthusiastic global promoters of knowledge societies, networking and lifelong learning dream today with a world converted into a giant classroom with a few powerful global teachers, and millions of assimilators of information and knowledge packages via the Internet. There is no dearth of professors, scholars and researchers of eminence in BRICS countries, and they must be given priority in all possible manners in which education is imparted. We must be inspired by the conviction expressed in Delhi Declaration, (March 2012) that there is a “storehouse of knowledge, know-how, capacities and best practices” available in our countries that can be shared “for the mutual benefit of BRICS as well as other developing countries.” BRICS must optimize such sharing possibilities, drawing upon its own assets. Quality imperatives have been a constant concern in BRICS Declarations. BRICS countries can set common standards and norms with agreed framework of norms and standards conducive to professional excellence. This can facilitate exchange of scholars and researchers. This can also inspire other developing countries to similarly adopt quality standards and norms. I would also like to comment the propositions before you for discussions to provide comparative research projects and information exchanges on instruments for the measurement and monitoring of the quality of education. Establishing a coordination body of the quality assurance agencies of the BRICS countries to develop BRICS standards of quality assurance in higher education can pave way for harmonized policy approaches among BRICS countries. A common policy framework which seeks to regulate a large number of private providers, operating in various technical areas such as management, marketing, accountancy, communication etc. and which award the diplomas and degrees, devoid of recognition in terms of equivalence or validity is necessary. An area which I would like to especially emphasize relates to values education. Universities as moral seat of learning must foster common human values so much needed today in face of challenges of globalization. Fostering humanistic mission of education is of paramount importance to counter the trend towards pursuit of material values and mere instrumental role of education. This should be given primacy in State policy in the sphere of education. In this context, I would like to emphasize the importance of “new global ethics for our common humanity”, mentioned in the Report of the High Level Panel of Experts, presented to the United Nations Secretary-General on 30 May 2013 on “A New Global Partnership.” It will be plausible for BRICS Network University to engage in reflections on this area of crucial significance. Information and communication technologies (ICT’s) have been evoked in the BRICS Declarations and are essential to the modus operandi of the BRICS Network University. We must reflect over the right to education, especially higher education in digital age. National laws and policy responses are not in pace with transformation of education systems, for instance from campus based learning to on-line process and webpage portals, or ICT led- twinning arrangements among Universities. BRICS Network University will need to critically analyze such developments as well as the repercussions of digitalization as regards human values and humanistic mission of education. Necessary measures should be undertaken, bearing in mind the importance of “universally accepted norms and principles of international law” with respect to use and development of ICTs through international cooperation, as underlined in the Brasilia Declaration. Recognition of degrees and diplomas and equivalence of qualifications obtained higher education institutions is a priority concern of BRICS. The Brasilia Declaration (July 2014) recognized the need to examine the recognition of studies and qualification in higher education institutions. In this respect, I would like to commend the “BRICS as New Form of Multilateral Relations: a Report of the Global University Network” (26-28 October 2015), which has raised a key issue: “neoliberal methods of evaluating competitiveness of higher education institutions in the academia”, introduced by the academic rankings. As stated in this Report, BRICS common goals demand more attention to “social function” of higher education institutions for “human development”, which is not taken into consideration in academic rankings. This is a most important theme for arranging interaction between Universities of BRICS countries. Today when there is wide-spread concern with skills development all over the world, BRICS Summits must be commended for addressing issues in skills development with a focus on technical and vocational education and training (TVET). The Brasilia Declaration (2 March 2014) acknowledged the need to address the challenge of integrating young people to the labour market and the critical role of TVET in preparing skilled workforce needed by the modern world. In a similar perspective, the Ufa Declaration (9 July 2015) recognized the importance of TVET and the need to “encourage students’ mobility among BRICS countries” and “possibilities of cooperation” in this area of critical importance. Initiatives through events and programmes around World Skills drawing upon best practices are most significant for opening new vistas. BRICS programmes on TVET can stimulate entrepreneurship and strengthen local production arrangements, providing innovative ways of skills development. BRICS Youth Policy Dialogue as new area of cooperation proposed in the eThekwini Action Plan, Durban Declaration (2013), remains important in order to respond to rising aspirations of youth by creating opportunities for employment, decent jobs and entrepreneurship as well as to the emerging needs for life-long learning. Exchange of experiences on evolving TVET system can be enriching. For instance, transition made to the Federal State Educational Standards and standardized higher vocational education, with admission based on a competitive basis in Russian Federation; National Programme for the Integration of Vocational Education with Basic Education for Young and Adults and expanding opportunities of TVET in Brazil; National qualification frameworks in South Africa; revamping TVET with skills development as high priority in India; and raising professional standing and social status of TVET and pursuit of professional excellence in China. TVET strategies and cooperation among BRICS in this field should have a system of equivalence in skills to foster exchange of skilled professionals among the BRICS. Besides, forging sustainable linkages between TVET institutions and enterprises is essential for making the system of TVET better responsive to labour market skill demands, as well as better able to contribute to industrial development. Public policies can take into account new directions on the changing landscape of TVET which emerged recently at the Third International Congress on Technical and Vocational Education and Training (TVET) on “Building Skills for Work and Life”, organized in Shanghai in May 2012. Instead of remaining a separate stream, TVET should be an integral part of the general secondary education, with pathways to higher technical education. This requires developing BRICS standards in higher education and TVET quality assurance, not only with respect to technical requirements of occupational sectors but also for developing social skills, critical thinking, and for cultivating work ethics with a sense of social responsibility. States must lay emphasis on the importance of high quality of TVET and should adopt necessary quality norms and standards, along with national qualifications framework and assessment systems for TVET, applicable uniformly throughout the country. These questions are examined in my Report to United Nations General Assembly in 2012, devoted to Technical and Vocational Education and Training from a Right to Education Perspective. I have been following the developments in BRICS countries with keen interest, and I will continue to do so. You will be considering national reports on TVET. I am sure, this will bring upfront the need to exchange experiences and approaches in a comparative perspective, recognizing the importance of making TVET socially more esteemed and professionally more coveted and rewarding. Allow me before concluding to offer some suggestions. Basic education systems differ in BRICS countries. It may be opportune to look into duration of basic education as well as possibility of introducing core common course(s) and study programmes in all BRICS countries. In the Education 2030 Agenda and Framework for Action adopted at UNESCO as already mentioned, all Governments including those of BRICS have made commitments to 12 years of secondary education as minimum with 9 years compulsory education. Accordingly, it is opportune to undertake a comparative analysis of laws and policies in BRICS countries on basic education in appreciation of its importance as building block for higher education. I hope, the BRICS Network University will lead to enhanced public investment in education recognizing strategic importance of this sector for endowing a country with future scientists, experts and leaders, and intellectual capital. Establishing the network of the research-and-education centers of excellence prioritizing the main areas of collaboration in the leading universities of the BRICS countries is a laudable initiative. Development of joint projects in different forms of postgraduate education with priority to Masters’ and Ph.D programmes as proposed can be an immense cohesive force in BRICS. I think, it is important to promote knowledge and understanding of political systems among BRICS countries. Introducing new courses in that perspective would bring BRICS academic community closer, bound by knowledge-sharing with a sense of oneness. All BRICS Universities which would be part of BRICS Network University must initiate new courses and research and study programmes on political system in BRICS countries as well as international relations and cooperation among BRICS to build bridges of greater mutual understanding and of rapprochement. BRICS is a global economic reality and a global force. BRICS must become education reality. BRICS can also usher in new dynamics of South-South cooperation. I hope very much that our deliberations would foster intellectual bonds among BRICS academic community, making it a unifying force and bedrock for the emergence of BRICS as a strong educational force. Shared position and collective voice of BRICS on education strategies can have great impact on global developments today and tomorrow. I will be happy to remain engaged with the BRICS countries and work together in carrying this process further.